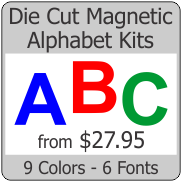 MagnetKing supplies many manufacturers with specialty magnet for a wide range of uses. We supply magnets used in appliance, automotive, electronics, consumer products, advertising & display and health & beauty industries. We can combine our wide range of magnet sheeting with over 1,000 films, laminates, foams and adhesives and then cut and package as needed. Starting with bulk rolls, we produce each order on demand. Please ask if you don't see what you are looking for. Glossy black vinyl surface and the back has the magnetic clinging force. Thin material..
Vinyl surface looks like brushed stainless steel and the back has the magnetic clinging force. 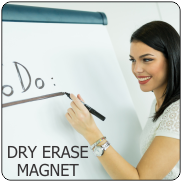 ..
Write on it with chalk or wet chalk markers, this special near black chalkboard surface has the magn..
Vinyl surface looks like shiny mirror chrome and the back has the magnetic clinging force. The uses .. Magnet is laminated with reflective vinyl, for reflective properties similar to emergency vehic..
Special holographic prism foil surface on the front, the back has the magnetic clinging force. ..